YouTube is a video sharing website which now has vast quantity of video clips of various categories since it was created in February 2005. You can always find one or more videos which meet your requirements when you are planning to add video clips to make your presentation more entertaining and informative to its viewers as visual images are really worth thousands of words. You may need to show some meaningful, or funny and interesting things to your kids in classroom. You are planning to make some vivid presentations to your sickbed patients to make their life colorful like one of our customers. "How can I embed or put a YouTube video to my PowerPoint presentation?" It depends whether you will present your PowerPoint presentation with Internet connected or not. Different situations require different approaches. So, this tutorial was divided into two parts. You simply have to know the URL of the YouTube video (e.g. http://www.youtube.com/watch?v=-AnQbSPWRmI) you like and then insert it to the very slide you want. Step 1: Click the Office icon in the top left corner and then click PowerPoint Options. Enable the Developer menu tab by checking the box next to Show Developer tab in the Ribbon on the Popular tab and click OK.
Step2: Click on the Developer tab on the menu ribbon and click the More Controls button. 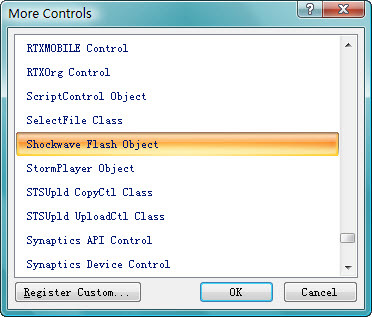 Step3: Choose Shockwave Flash Object from the list of controls and click OK.
Step4: Use mouse to draw a box on the slide where you want to add the YouTube video. Right-click the box and choose Properties. Step5: On the YouTube page with the video you want to add to your slideshow, copy the URL (located in the box, not the address line) from the sharing area. Step8: Close the Properties tab when everything is done. Preview (Run) your slideshow to verify these steps worked and you should see the YouTube video appear in the slide you pasted it on. The video will not appear in PowerPoint edit mode. Done! Accordingly, if you have PowerPoint 2003 and earlier versions, go to View -> Toolbars -> select "Control Toolbox". You may find that the process above is a little complex. Then you can refer to the second solution below to add your Youtube video using an add-in named Youtube Video Wizard. Step1: Download the YouTube Wizard from http://skp.mvps.org/youtube.htm. You should pay attention to that you need to download different zipped package for PowerPoint 2003 or PowerPoint 2007. Step2: Extract the contents of the zip to a folder. Then follow the Installation Instructions on http://skp.mvps.org/youtube.htm to add the add-in to your PowerPoint. I have PowerPoint 2007. After doing this, I can get a new choice named "Youtube video" when selecting the Insert tab on the menu ribbon. Step3: Find the URL (located in the box, not the address line) for the video you chose from the sharing area. Then follow the wizard of the new add-in to insert Youtube video to your presentation. You are also allowed to resize as well as reposition the player anywhere on the slide. The approach in the first part works great if only the presentation have Internet connected. What can we do if we do not have internet access when presenting? You may take this solution. ->> Have no internet access when presenting. ->> PowerPoint supports adding many different types of movies, including AVI, MPEG, and WMV. 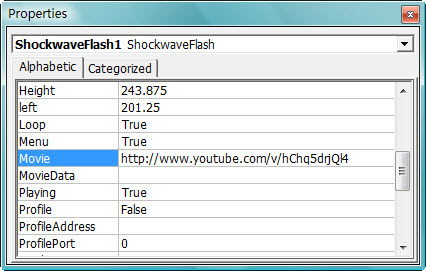 ->> YouTube videos are Flash movie (FLV) or MP4 formats by default. ->> PowerPoint doesn’t understand flash FLV files. Step1: Download and save Youtube video as WMV or AVI format to your local drive and then use online conversion service or some video converter to do this. You may download a free Youtube downloader to download your favorite video movies, which is also FLV converter that allows you to convert your FLV video to other formats. Below are some recommended online converting websites. You may choose any one to work for you. Step2: After getting the video on your computer, go to Insert -> Movie –> "Movie from file" to embed the YouTube video in the slide you want if you have PowerPoint 2007. If you have PowerPoint 2003, select Insert menu, point to Movies and Sounds, and then click Movie from File. Step3: Choose the movie you saved and click OK. Then you will be prompted to choose how you want the movie to start in the slide show, Automatically or When clicked. Automatically is recommended. Completely done! Enjoy the fun of your Youtube video off-line. Sometimes, you may also want to share your PowerPoint presentations on Youtube. At this point, you can use our PowerPoint to Video converter to convert your PowerPoint presentation to MP4, WMV and then upload PPT files to Youtube with high quality.